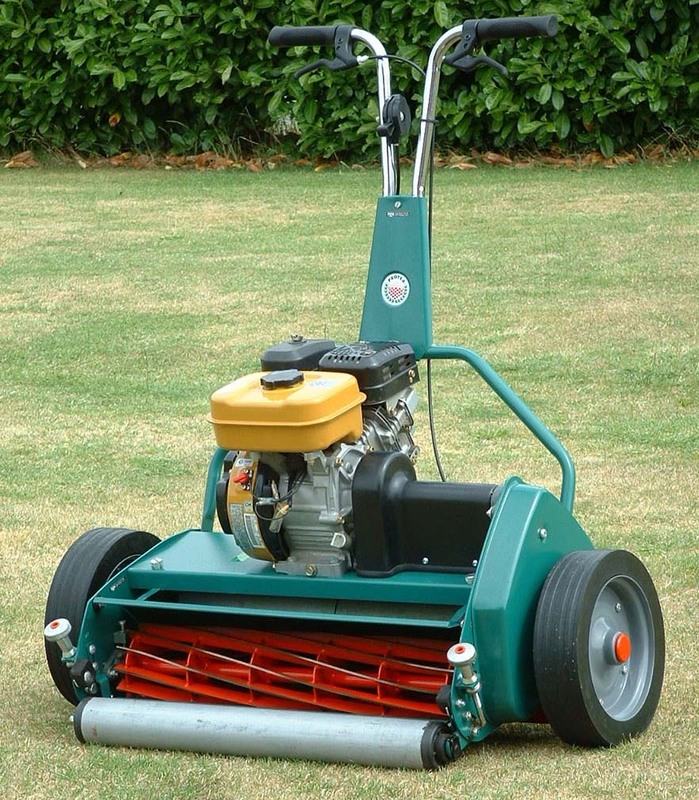 Protea GOLF greens and tees mowers are designed and constructed to provide the highest possible quality of cut consistently over extended periods and to meet the rigorous demands of modern golf courses. They will also appeal to cricket clubs, the dual-drive system and “click” height-adjusters making them ideal for wickets and squares. The GOLF is a development of the best selling Protea Greensmower and shares the same Subaru Robin EX13 engine, adjustable smooth rear rollers with roller scraper, shaver bottom blade and adjustable brush strip. The dual-drive system allows the rear rollers to be disconnected from the cutting cylinder for self-powered transport. 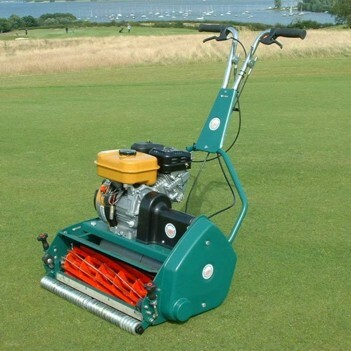 The GOLF is available with 12-blade and 9-blade precision-ground cutting cylinders, individually tested prior to assembly. Independent cutting trials coupled with microscopic turf inspection have revealed that the GOLF’s cutting quality is equal to that of machines costing over twice its price. Optimum balance makes handling feel effortless whilst controls are non-tiring and easy to use. Gearing has been chosen after extensive trials to give an ideal range of ground speeds. The light landroll clutch control facilitates “inching” in tight turns. Weighing less than 80kgs, the GOLF features low ground pressure, reducing ground compaction and making it especially suitable for Winter greens. A height adjustable and removable brush strip is mounted ahead of the cutter. Made of densely packed durable nylon filaments, it further enhances cutting quality by raising horizontal growth and sweeping surface debris far more effectively than conventional steel combs. 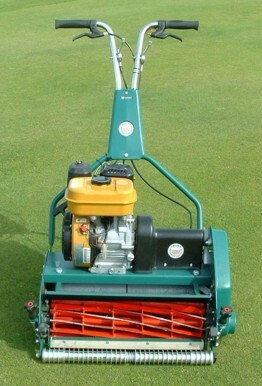 The Wiehle (grooved) front roller, fitted as standard on 12-blade models and optional on 9-blade models, minimises turf flattening and resists soil pickup. The short wheelbase follows contours accurately, reducing the risk of scalping or bridging. The rear roller can easily be adjusted for perfect alignment with the bottom blade to ensure a ‘set’ never develops throughout the life of the machine, and a removable roller scraper is fitted as standard. Cutting height adjustment is quick, simple and accurate. Dual micrometer “click”-type height adjusters are fitted as standard on all GOLF models, permitting rapid and accurate height adjustments without the need for tools or a setting gauge. Continuously variable adjusters remain an option. A separate wheeled transport cradle is available to protect the cutting cylinder, bottom blade and steel rollers from damage over hard surfaces. The engineering simplicity of the GOLF makes servicing and maintenance easy and economical. Its open frame design allows for easy access during cleaning and maintenance. Reassuringly for professional users, a full range of spares and service parts is readily available at sensible prices with a next-day delivery service. A two-years parts and labour warranty is provided together with full telephone technical support. Engine Subaru Robin EX13 single-cylinder air-cooled 4-stroke overhead camshaft petrol. Displacement 126 cc. Maximum horsepower 4.5 @ 4,000 rpm. Recoil starter. Cutting Reel 152 mm diameter, 12 spiral blades. Rollers Wiehle multi-section aluminium & steel front roller with precision dual adjustment for cutting height. Height-adjustable two-part smooth steel rear roller with adjustable/removable scraper.